During the Disney Magic’s recent 14-Night Transatlantic sailing from Galveston, Texas to Barcelona, Spain, over 300 passengers joined cast and crew members to create a 9 foot by 24 foot mural featuring The Little Mermaid as part of a PaintFest at Sea activity. The mural was designed by Don “Ducky” Williams. Seventy-two individual canvases were created with pre-drawn lines with color codes; think ‘paint by number’ on a grand scale. Guests were invited to join crew in painting the canvases in Animator’s Palate while crossing the Atlantic Ocean. On Saturday, when the Disney Magic arrived in Barcelona, a group of Disney VoluntEARS from the ship as well as cast members from the Disney Store in Barcelona joined forces to install the mural at Hospital General de Catalunya. Disney VoluntEARS paint specially designed murals with Disney character art during PaintFest at Sea events. 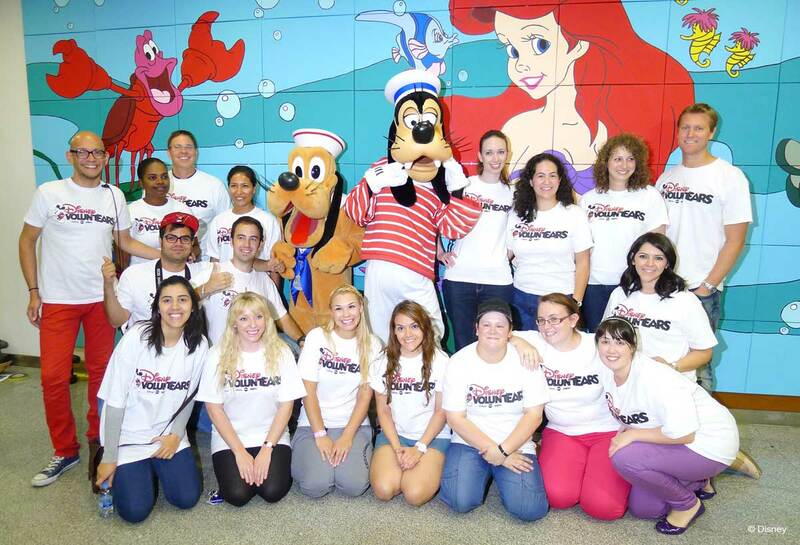 This group activity from Disney’s VoluntEARS is in coordination with the non-profit, Foundation for Hospital Art. The finished artwork is then donated to hospitals in the communities Disney cruise ships call home. Since 2005, Disney Cruise Line VoluntEARS have donated more than 900 hours to hand paint 47 different murals for delivery to hospitals and care facilities in Disney’s ports of call. This entry was posted in News and tagged Barcelona, Disney Magic, Transatlantic, VoluntEARS by Scott Sanders. Bookmark the permalink. My Mother, Son and I worked on the pink, purple and yellow fish (:36) under Ariel’s right arm!!! This was so much fun.